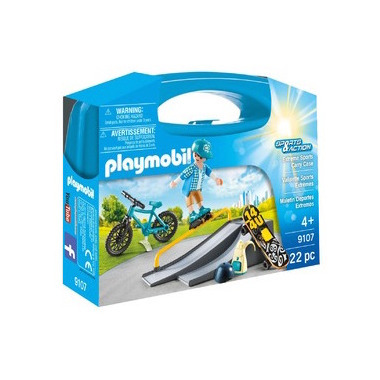 Show off your skateboarding, biking and rollerblading skills with the PLAYMOBIL Extreme Sports Carry Case. 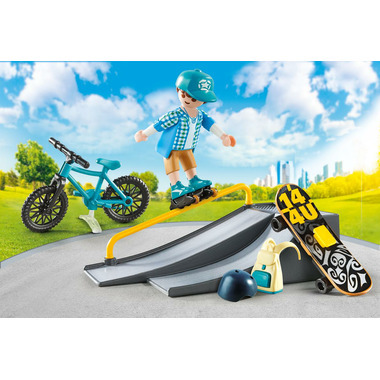 Put your helmet on and glide down the ramp with your choice of skateboard, bike or rollerblades. Let your imagination play! Once playtime is over, simply store the pieces inside the take-along carry case for next time. Inspires children to create their own adventures and let their imagination play. Encourages children to explore and learn while having fun.